A long time client arrived in my office recently with severe jaw pain. It was significant enough that she was not sleeping well, thereby making the pain worse. She was in a cycle of pain and stress that she could not break. TMJ Disorder involves dysfunction around the Temporomandibular Joint, a joint that connects the jaw to the skull. It is not within my scope of practice to diagnose what conditions are, but it is my job to assess what is happening from a soft tissue standpoint. Soft tissue includes musculature that can become tight or dysfunctional for a variety of reasons thereby affecting joints in the body. TMJ Disorder can cause pain in the jaw joint or in the muscles that control jaw movement. Symptoms of TMJ Disorder according to the Mayo Clinic can be as follows. In my client’s case she described her situation in an email to me as the following. “I had really suffered that first week. The pain was throbbing so badly that I was unable to sleep for more than hour or two at a time.” When she initially contacted me I was not able to see her immediately. I recommended trying moist heat and self massage around the muscles of the jaw. She also used ibuprofen and acetaminophen in addition to trying essential oils. Doing this helped diminish the pain but when she arrived in my office two weeks after the initial contact she was still experiencing moderate pain. Upon my oral intake she expressed that she was under a significant amount of stress and that the increase of stress in her life coincided with her jaw pain. We immediately discussed some self care techniques that could assist with the stress in her life. Among these were journaling, meditation and especially dialing down her central nervous system before bedtime to “downregulate” from the stress of the day so that she could sleep better. Together we found activities that worked for her in the past but that she was currently not using. I think it is important to always find things that may have worked in the past for a client, so that they can get back into a habit that may be helpful, especially regarding self-care. During the massage session I focused on the musculature around the neck to begin with to help her relax. 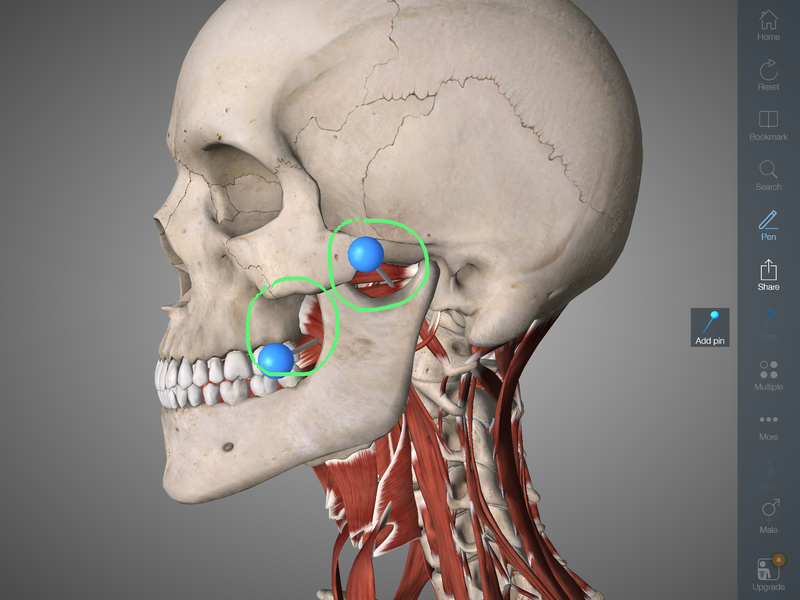 From there I moved on to the specific muscles involved in movement of the jaw. Some of these are able to be massaged through the skin of the face. However, there are the deeper muscles of the jaw, the Pterygoids that are better accessed inside the mouth. I obtained consent to work on these deeper muscles and they are easily palpated and massaged using a latex or nitrile glove. Working carefully, I made contact with the Pterygoids and then instructed the client to gently open and close her mouth. This allows her to feel where these muscles are located. This is vitally important because it is simple enough for her to do this in her self-care routine once she leaves my office. 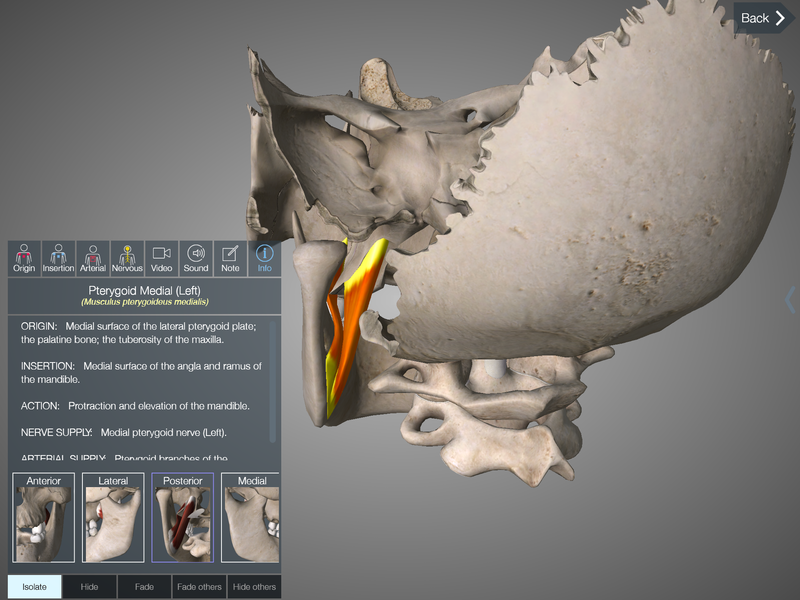 The bottom left pin identifies the Medial Pterygoid. 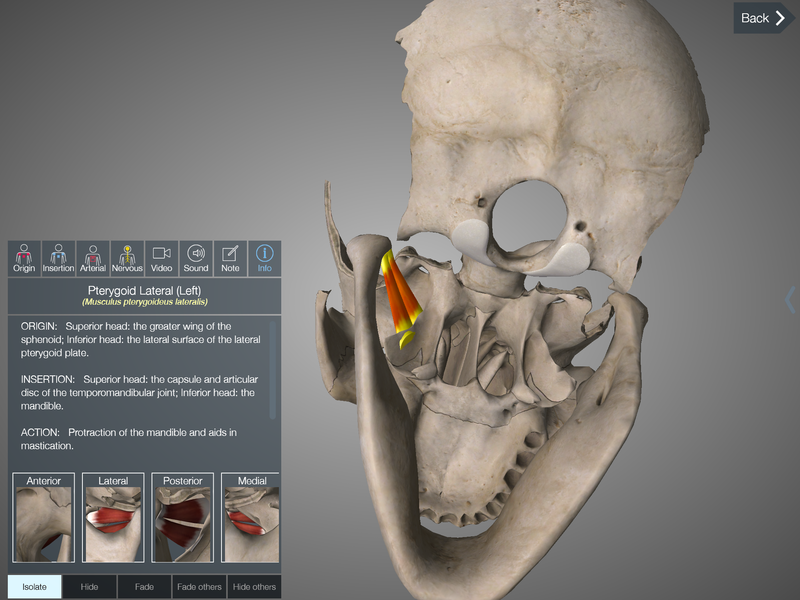 The upper right pin identifies the Lateral Pterygoid. 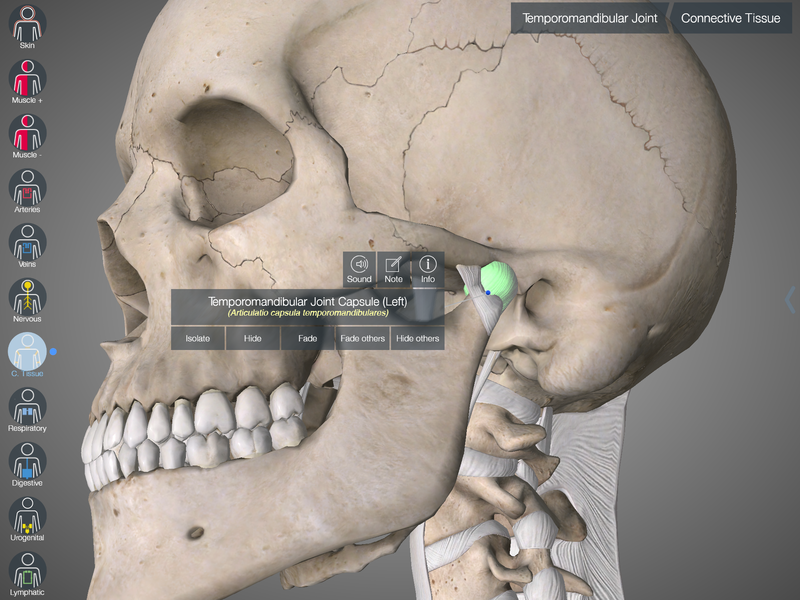 This lateral view illustrates why working inside the jaw makes better sense for effective work on these muscles. The intra-oral work does not take long, just a few minutes and then I go back to doing more work around the external jaw, neck and shoulders. I always like to work on healthy breathing as well. Between the massage therapy I provided along with new awareness and pro-active self care she was free of jaw pain after one visit. The above is a best case scenario relative to one person’s jaw pain. I know many people suffer from jaw pain and are prescribed splints to wear at night because of grinding. I, myself, used one for about a week one time but chewed right through it in no time. I felt that the root cause was a bad habit of grinding related to stress and I’d be better off managing the stress instead of putting a splint in. However, my wife uses a splint nightly and it helps with chronic headache pain. I think each person has to find out for themselves what will work and implement that into their self care program. I have had doctors tell my family that stress is a primary factor in jaw pain that leads to TMJ Disorder. Getting a handle on stress is hugely beneficial to managing all kinds of pain. For my client, the massage she received was one key part in getting beyond the pain cycle of her jaw pain. But incorporating other activities to help her manage her stress were major contributors to putting the pain behind her. This entry was posted in Case Studies, Empowerment, Enrich and tagged case study, Jaw pain, massage therapy and jaw pain, Raining Faith Massage, stress, TMJ Disorder, TMJ pain by Matthew. Bookmark the permalink.